If Santa had a list of sassy and sweet, I’m pretty sure I’d make the sassy—never classy—index. But he doesn’t. So I figured I’d create one of my own, especially for you, avid New Times readers and rabid liberal rag haters (who read the paper, purely to be mad at it). Haters gotta hate. You know what I’m sayin’. And they do with vigor and venom. They come into the office and yell at the editor; they write long ranting emails to the staff; and they call with anger and angst about “the media” that perpetrate all kinds of wrongs against the world. But I don’t mind. I kind of like it. It puts the ghost pepper in my hot sauce and the lemon juice in my lemonade. It keeps me sassy, saucy, and salivating. Those haters, though, they’re definitely on the sassy list. And for that matter, so is 2nd District Supervisor Bruce Gibson and his pen-tapping impatience with the supervisors he doesn’t agree with. I kind of like it, so it’s not bad sass. Keep it up—stay sassy, man. San Luis Coastal Unified School District Superintendent Eric Prater was sassy enough to negotiate a home loan into his contract. And the school board was sweet on him, so they decided, “What’s the hell? What’s the worst thing that could happen?” Yeah, it totally makes sense to lend nearly $1 million to someone so they stick around for at least five years. Because the school district should be treated like a bank by its employees. I mean, what else is it good for? Especially when everyone at the district’s running around in circles, trying to figure out how they’re going to make up for the $8 million funding shortfall that’s coming when Diablo Canyon Nuclear Power Plant starts to shut its operations down. I guess they can always fire people. But I get it. The poor guy was renting! Who even does that anymore? It’s not like he could get a bank loan; he only makes $215,000 a year. Who can buy a home on the Central Coast with that kind of money in their pocket? The median household income (with two earners) is a little more than $60,000, while the median price for a home is a little more than $600,000. He definitely needs to be in a home that’s $400,000 classier than whatever shack sells for that price. As if! Maybe I should make a stupid list and put all the school districts on it. According to San Luis Coastal’s school board President Kathryn Eisendrath-Rogers, this school-district-playing-bank thing is becoming more prevalent. Why not? It’s like heroin. Everybody’s doing it. “It’s a really solid investment for us,” she said. Boy, it sure is—unless he defaults on his loan payments. But then again, I guess the district owns the home after that. House party! I definitely know one thing: I want Prater on my team the next time I’m negotiating my contract with New Times. Hey Prater, how much do you charge for freelance? You know who I don’t want on my team? All the sassy peeps going back and forth on social media about the election! Still! I know it isn’t going away, but really? Can’t we have a discussion? Does it always have to be angry? Take a deep breath and approach the situation like adults. That’s some sass that needs to go. Former SLO Mayor Jan Marx had a hint of attitude with her letter to the editor in last week’s New Times. She apparently isn’t happy that 47 votes determined the outcome of the election. But she sassily admitted that she accepts it. Well, she really doesn’t have a choice now, does she? And, her math is a little off: It wasn’t only 47 people who voted for new SLO Mayor Heidi Harmon. It was half of the voters in San Luis Obispo plus 47. But I guess Marx has another thing to worry about other than disgruntled voters: Kevin P. Rice, the not-so-sweet political “activist” who really likes filing complaints with the Fair Political Practices Commission. His most recent claim—this time sent to the city—targets the former mayor and SLO County Democratic Party Vice-Chair Cory Black, alleging that they laundered money. That’s a complaint with dramatic flair for campaign contributions totalling $900. He says they broke SLO city law, but I think he forgets that he doesn’t get to make the determination. Rice sassily thinks that he’s the one who gets to be judge and jury! He is, after all, the only person who isn’t afraid to take on everyone he disagrees with and everyone he doesn’t like. Sounds sassily familiar … like maybe the behavior of the president-elect? But I guess Rice hasn’t figured out how to use Twitter yet. It seems like Rice likes to kick people when they’re down, up, and even facing him. But that’s an allegation and an opinion, not necessarily the truth. Russia. I can’t remember the last time it made so many headlines. Maybe it was during the Cold War? It’s hard to know what’s true and what’s false. But maybe that was its intention all along? Hah! That’s pretty sassy. Oops, I forgot to add people to the sweet list. But, you know that’s not really my thing. I’m sweet enough! The Shredder knows all about sassy. Now have a Merry Christmas, you filthy animals! 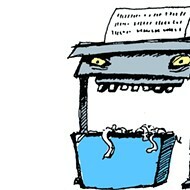 Send comments to shredder@newtimesslo.com.